Is it possible to pour a quality foundation footing in sections to replace a failed cottage foundation? Existing cottage is 18'x32' on sand, near lake michigan with an existing foundation consisting of concrete blockcmu 24" in the sand , no footing. wavy floors 1930's cottage wisconsin. The answer is yes, you can build sections of the foundation and tie them together by drill and epoxying dowls into the section previously built. Without a photo to see the actual condition, I'm not sure if the two options presented here will work in your particular situation but I hope it will point you in the right direction. Obviously the first option is to dig out the existing block wall and replace it with a new concrete wall or new concrete block wall. The sections footing foundation you mentioned comes in to play because this type of work had to be constructed in sections. 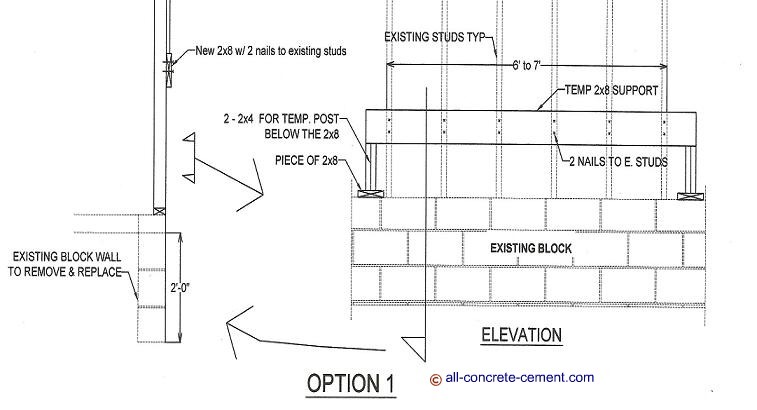 The sketch above show an extremely important procedure - that is shoring of the existing house using 2x8 beam with post at each end. This will hold the framing in place while the excavation and demolitions are being done. Adjacent to the 2x4 post, though not shown in the detail should be another piece of 2x8 driven into the sand to support the post. below the cottage's interior where it is extremely difficult to fill after the new foundation wall is poured or worse the slabs collapse. The fact that the cottage survived all these years is a clear indication that concrete wall or block wall will work fine. Due to the difficulty of working with sand in this type of project, constructing a wall adjacent to the existing as shown below is probably the best option. For this option to work the existing framing need to be extended outward by about 3+/- inches. 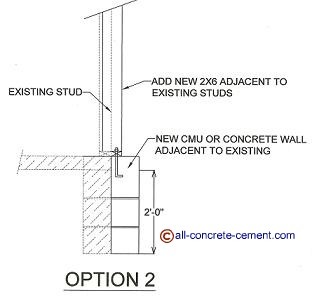 This can be accomplished by installing 2x6 studs adjacent to the existing studs such that the new 2x6 protrudes outward. This not only allow the load to be shared between two foundation walls, the new foundation wall will strengthen the existing. The foundation wall must be installed prior to modifying the stud walls. The shoring detail per option 1 will be needed for this option as well. Should the existing foundations are severely damaged, excavating may cause them fall out of place causing the structure to collapse. As far as wavy floors, I think they are caused by water contents in the sand. Since the foundations are only 2ft high, water freely moves in and out causing rise and fall in water content which will certainly affect floor level.